I have been playing a brass instrument for over 50 years. During those years my life has been enriched working with musicians, actors, artists, dancers, sculptors, writers, film makers and photographers as my career as a player, arranger, teacher, mentor and conductor has unfolded. Being a musician is a vocation, it is all-consuming. It is creative, opens doors, influences my thoughts and actions and even who might be my friends. It can be risky, passionate, stimulating, nerve-wracking, disciplined, mind broadening, frustrating and sometimes, if I'm making heavy weather of my travel arrangements, a little dull. 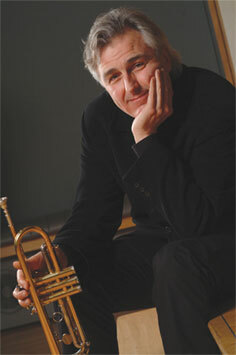 My very first pro job was as co-Principal trumpet with the Royal Opera House. The Royal Opera House is one of the world's great musical institutions so this offered me the chance to work with illustrious conductors such as Carlos Kleiber, Sir Colin Davis and Sir Georg Solti. I then spent many years touring with the Philip Jones Brass Ensemble as the youngest ever recruit, as well as with the English Brass Ensemble and the London SInfonietta. With the PJBE we enjoyed almost rock star status in brass-mad countries like Japan, travelled the world and made some incredible recordings. I took some time out to spend a week in the south of France competing in an international trumpet competition based in Toulon. I managed to come second but no disgrace as the winner was H�kan Hardenberger, but this experience fuelled my enthusiasm to develop a solo career. Around this time I met the conductor John Lubbock who invited me to become a member of the Orchestra of St John's and I also teamed up with the musicians who are now collectively known as the Britten Sinfonia, one of the world�s most celebrated and pioneering ensembles. Nearly four years as principal with the BBC National Orchestra of Wales was a thrilling experience - great to play all those glorious romantic symphonies - but my heart was always in chamber music so I joined Fibonacci Sequence, a fabulous group created by pianist Kathron Sturrock and became a member of the London Mozart Players, eventually becoming its Chairman. I've worked with some iconic names in music such as Witold Lutoslawski, Pierre Boulez, Sir Michael Tippett, Sir Peter Maxwell Davies, Sir Harrison Birtwistle, Shirley Bassey, Barbara Streisand, Michel Legrand and Sir Paul McCartney. I've met a few political figures such as Denis Healey, Tony Benn and Margaret Thatcher and quite a few of the Royals. As a studio musician it was a privilege to perform on some of the 20th century�s most memorable film soundtracks and to commission and premiere brilliant new works from leading contemporary composers. 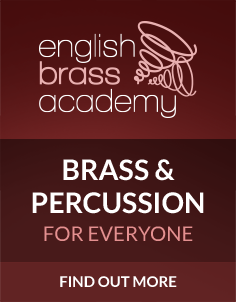 I've launched a brass education academy and my own record label, published several sets of arrangements, written methods and studies to support players with their technical development, and taught and mentored some wonderful players, many of whom have gone on to become music professionals too. I realise, as so many people do, that it was my so-called formative years and the teachers and supporters I met along the way, that underpin my approach to music and my values as a player. I was born in Leeds in 1956 to John and Eva Archibald, Salvation Army officers and keen amateur musicians. I and my older brother John, led itinerant lives as mum and dad were posted around the country often only staying in post for between six months and two years. Inevitably, approaching 5 years of age, I joined my brother John in the local Salvation Army young people's band on tenor horn and the daily ritual of practice began. Encouraged by traditional �Sally Ann� values of community and support, I worked my way from 2nd horn through to solo euphonium, and eventually to cornet at the age of 14. Eight schools later my mum signed me up for a music course at Clarendon College, Nottingham, introducing me to a world of formal music training which proved to be the most influential study period of my life. Clarendon College, with its maverick approach to music education, introduced me to avant-garde composers, exotic contemporary brass music, 12-tone row aural exercises and the vagaries of the Cornett and 'period' music before the term had become standard. Ernest Hall, the legendary British orchestral trumpeter, kindly awarded me the ARCM diploma despite his concern over the 'brass band' vibrato and suggested I should take more lessons. At 18 I signed up to three years at the Royal Academy of Music in London, studying with William Overton (ex-principal trumpet with the BBC Symphony Orchestra) and the occasional lessons from James Watson (ex-principal trumpet RPO). It was during my study at the RAM that the English Brass Ensemble formed (originally called Albany Brass Ensemble) and my interest and passion for brass ensemble music developed from its early beginnings at Clarendon College.